We are authorized dealers of reliable, cost-effective, quality SILPAULIN Brand â€œMultilayered Cross Laminated U.V. 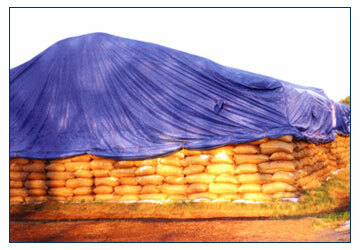 Stabilised Filmsâ€� (Tarps) in India. The SILPAULIN Film comprises of several layers of plastic film placed Criss-Cross over one another and bonded by a patented cold-roll technique. These are cross-laminated sheets that make them Lightweight and super strong. These tarpaulins are acid & alkalis Proof, UV stabilized, heat sealed, rot & weatherproof tarpaulins. 100% Waterproof. Ultrasonically welded super strong. Silpaulin Tarpaulins confirming to BIS 14611-1998. • 100% Ultra-violet Stabilised Cross Laminated Films. • Eyelets and Rope lashing. • Multilayered cross laminated tarpaulins have waterproofing properties in the basic material itself without the use of a secondary agent. • Specially UV treated to resist radiation, and is inert to most chemicals and acids. • Excellent tensile strength. Tear and puncture resistance help to withstand sharp impacts. • All weatherproof with the ability to withstand tough climatic extremes. • 100% re-cyclable, hence it is environment friendly. • Applications in agricultural, industrial and heavy machinery sector. • Used for fumigation of tobacco leaves, food grains, grapes and other agricultural produces. 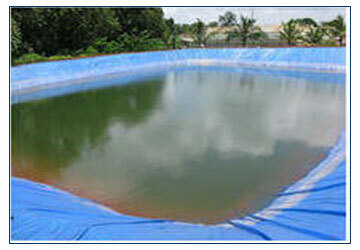 • Extensively used for Farm ponds, pond lining, resh water ponds, fishponds, raw water reservoirs, community water tank and portable water tank. • Used for Poultry curtains and roofs as well as cattle sheds. A laminate comprising of atleast two biaxially oriented filim are bonded to one another, each comprising of polymeric material having grain structure that imparts a predominat direction of split ability. 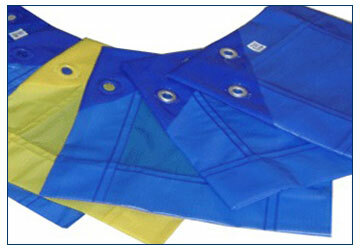 Each tarpaulin is made with panels of even tone and is U.V stabilised by incorporating U.V. absorbers. The ends and sides are hemmed by heat sealing and eyelets are fixed at approximate interval of 3 feet. All four corners are reinforced by special triangular pieces of the film support and the eyeletted.